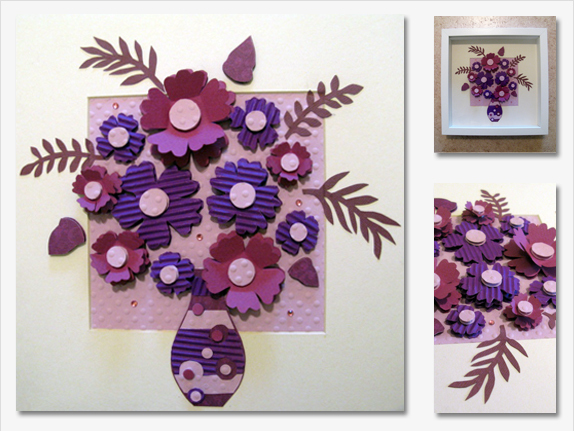 Haven’t you ordered your Valentine’s Day Flowers yet? Why not doing something different this time and that lasts? 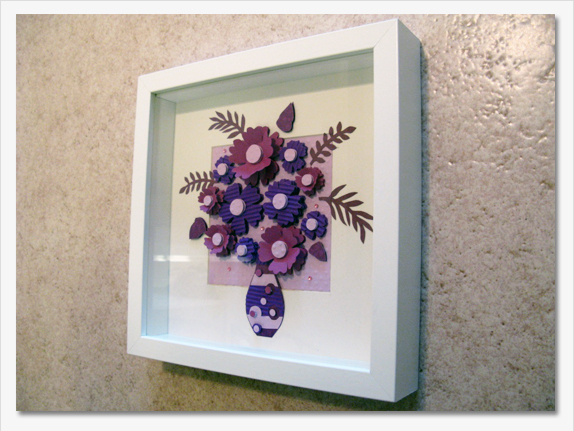 Instead of giving real flowers, why not giving paper flowers in a frame? I did theses ones for a member of the family. 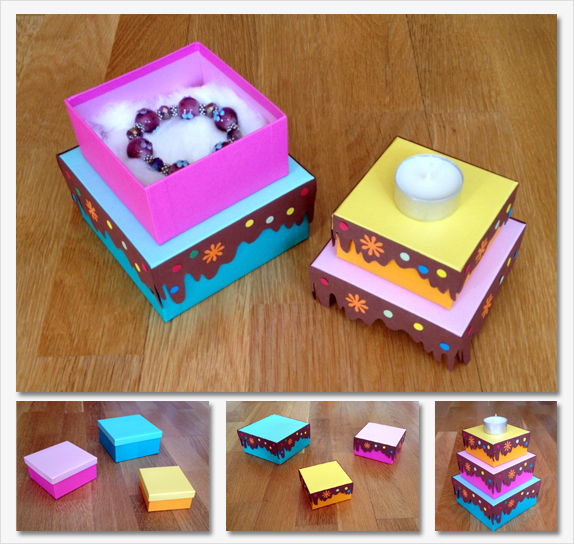 If bracelets or earrings are on your list of gifts to give as birthday presents, or you think your present is too small for the occasion, whatever the reason is, this post will encourage you to not settle for the boring rectangular box and make this a very special gift. Christmas is only a few weeks away, and it’s around this time of the year that the lights start to appear on everybody’s windows. 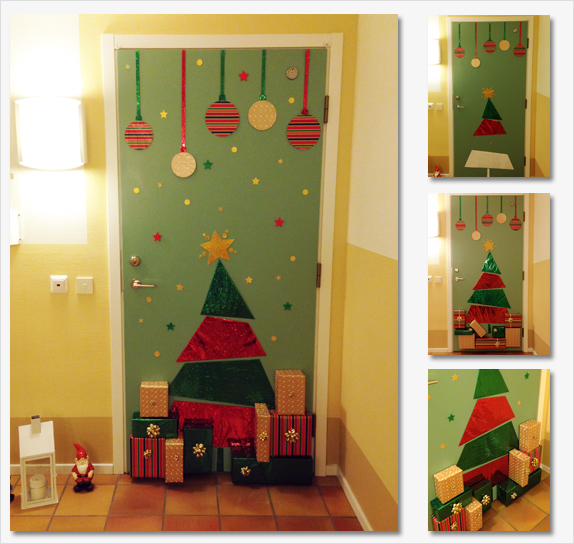 This year I wanted to give a welcome Xmas to everyone that stopped by… with just wrapping paper, boxes, bows and tape. Keeping kids’ rooms organized is a challenge for most parents. And if you have a collector of handbags, jewelry and princess’ dresses like our oldest daughter, it can be especially difficult to keep the space neat. 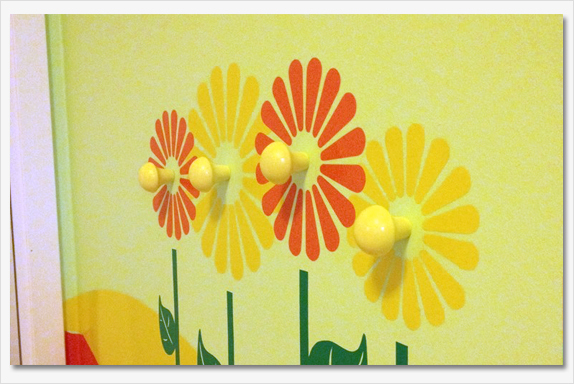 Hooks are a fantastic way to get that stuff off the floor and can also be a decorative element in a kid’s room. Perfect also for small apartments, like ours, or if you have little kids, you hang it at the level the child can reach it and this will make them feel more important and in turn want to use them! 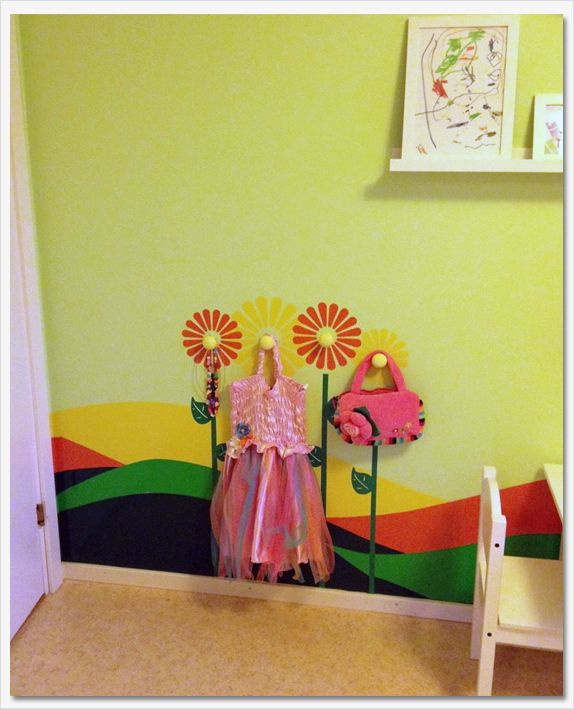 There are many cute styles to choose from in the stores, but I wanted to do one that would go with our girls’ room’s decor. 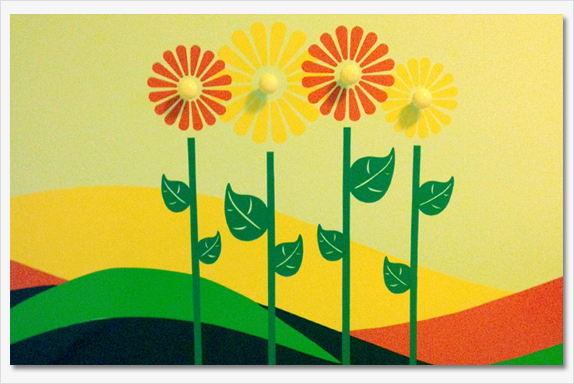 So here it is: I bought 4 yellow knobs that work as hooks and made 4 vinyl designs to complete flower arrangement. Our daughter really enjoys hanging up her bags on these flowers! As a child I always wanted a proper cubby-house (lite koja in swedish). With my sisters or friends we always built them from sheets, boxes and whatever we could find. But in the end it didn’t matter, we always had a great time and it was a fantastic way to make us express our inventive side. Now I am a grown up, mother of two beautiful girls that make you remember every day when you were a child. And the feeling is amazing. And she enjoys it a lot which makes mommy very happy. Who didn’t have or see a “hippie van” back in the 60s? Whoever is from those years must recognize this kind of van, bringing back good memories. And that is what I wanted to give to my boss, good memories as a thank you for everything she did for me and my family. She lost her husband recently. Sometimes good memories can keep you going during tough times. This van was one of many illustrations that I did for the 2013 Multicultural Calendar, a project that we worked on together (one out of several that I had the pleasure to work with her on). It was her favorite one, so I did it in 3D and framed it. And on the license plate I added in Swedish “1000TACK” (tusen tack/thanks a million). Glad you liked it Meta! Gorgeous couples deserve a gorgeous wedding. Madeleine and Joe are that couple. Their wedding was not only gorgeous but romantic and elegant… with a 50’s touch. And that is what they wanted for their wedding invitation where I came along. Their ceremony was going to be held in their garden so I thought having heart flowers would be a nice touch for the layout. They also wanted to have some inserts in their invitation such as directions, accommodations, RSVP, etc., so what a better choice than the pocket invitation; organized on both the inside and the outside to make a good impression to their guests. *The outside envelope is handmade. The rest was printed at Wikströms where they did an excellent job. Thank you Madeleine and Joe for letting me be a part of your special day. You too are truly meant to be. Congratulations again! I wanted to give a present to my brother in law and his partners at the Lingon Restaurant as a thank you for helping us move to Uppsala. So I decided to do a framed design that would go with their decoration; a framed button art came to my mind with the image of their logo on it: the lingonberry. A piece of burlap, a pack of mixed-size buttons, glue, some sequins and I got started. So I traced the lingonberry onto the fabric with a black ink pen (since the chalk didn’t work very well), then I laid the buttons onto it without gluing them. After seeing how it was coming along I started to glue them on the burlap one by one. To cover the ink edge and to give a sparkling touch, I added the sequins. To make it personalized, my husband gave me the idea of signing it by sowing my name on it. And that is what I did adding my initials and year. Final step, I secured the burlap to a piece of thick cardboard with staples, and popped it back in the frame. I removed the glass since the buttons would stand out more without it. And here it is! Already hanging at their restaurant! In 2011 I was asked to design a multicultural calendar for 2012. The goal was a colorful and friendly one that emphasizes certain important holidays from cultures all around the world (among other requirements). I thought to myself: this is going to be so much fun and it fits me perfectly since I am an immigrant myself and I enjoy to learn more about different cultures. One thing that stuck in my head was that they wanted the calendar to be approachable in schools and that was the key for me to come up with a more “playful” and lively design than the previous years. So I decided to go with vivid colors and to make a collage of the elements representing the highlighted holidays for every month. Another thing that I wanted to add to the calendar was something characteristic of Sweden: the weather So every top design has a little weather section in the bottom left corner, of the top design, and also a color scheme that goes with that particular month of Swedish weather. To see the rest of the calendar, please see the slideshow here and I would love to hear your opinion. I always wanted to have a Christmas village at home for the holidays. I love the Department56 lighted houses, but it’s kind of difficult and pricy to get them here in Sweden. To let it snow, I bought some snowflakes that my husband helped me to hang from the ceiling. And let’s not forget thin paper on the windows to create the glass effect to let the light go through them from the background. There is no Christmas without Santa Claus, so… I added some vinyl as a background. Merry Christmas and hope you have had as much fun doing your decorations as I had doing ours!! !